Before I started Eternal Perspective Ministries, I served as a pastor for 14 years. When I was in the ministry, I found myself spending a great deal of time ministering to dying people and comforting their families. People look to pastors for guidance, help, and perspective during difficult times of life. Joel Woodard serves as a pastor at Cornerstone Church in Gresham, Oregon, along with my friend Barry Arnold. Several of our EPM staff members are part of Cornerstone, and have recently experienced the deaths of loved ones, and Barry and Joel were there for them. In fact, Nanci and I attended three memorial services the two of them conducted together, and I was touched by their hearts of love for these dear families. I never imagined that I would find myself so familiar with death as a pastor. I studied theology in seminary and learned about expositing a text and leading the church, but I don’t ever remember reading a book about what to do when visiting someone on their deathbed. Looking back over the past seven years, I’m astonished at how many times I’ve found myself in that exact position, feeling very unprepared as I kneel beside someone’s bed, hold their hand, and pray with the family. I know every hospital in the city near where I live, and even where to find the good clergy parking spots. I’ve also seen firsthand how we, as a society, are so uncomfortable with death. Most people simply don’t know what to do or say in those moments, and so they call for a pastor. 1. You serve as a priest. The first several times I was asked to make hospital visits, I went along with an older pastor. He told me, “In situations like these, people just want to hear you say God.” They simply want to know that God is there and has not forgotten them. As a priest, you represent God to people and are given the opportunity to pour His words over them as a blessing during difficult times. Enter that time ready to share from His word, say a prayer, and offer comfort. You represent Christ in that moment! 2. You enter sacred space. For several years, my wife Amy and I served as missionaries in a little Alpine village in Slovenia. The old Catholic church in the middle of town marked each hour with the ringing of the bells. What I wasn’t prepared for is that it marked every holiday, wedding, and call to mass as well. I can still hear those bells ring if I close my eyes. Those bells also rang as funeral processions marched from that old church building to the cemetery located directly behind it. The long ringing of the funeral march was off rhythm, almost like it was causing a rift in time. In that place, you’re born, get married, and celebrate holidays all in the rhythm of the bells, but upon your death, the bells are interrupted. I always thought of these moments as sacred space, caught between this world and the next. It’s the precious moments of transition when eternity takes the baton from the runner who has left their earthly body. So set time aside to enter these hallowed moments. Holidays will come and go, work and school will fall back into place once the funeral bells are done, and life will go on. Don’t miss the window to be in that sacred space. In those moments by the deathbed, it helps to remember you don’t leave when it gets uncomfortable, and you don’t have to fill the silence with empty words. As a pastor, you also enter cultural discomfort about the dying body. For some reason, many people are afraid to touch a person on a hospital bed. Maybe they’re afraid they will break the person or make it worse, but those last touches are special: a kiss on the forehead, the caress of a hand, a whispered “I love you.” If everyone is hugging the wall, lean right in. Grab the person’s hand if you’re able, and invite their loves ones to get over their discomfort and embrace those intimate moments. 4. You invite people to see eternity. If sickness hits or the cancer comes back, we naturally hope for the best. 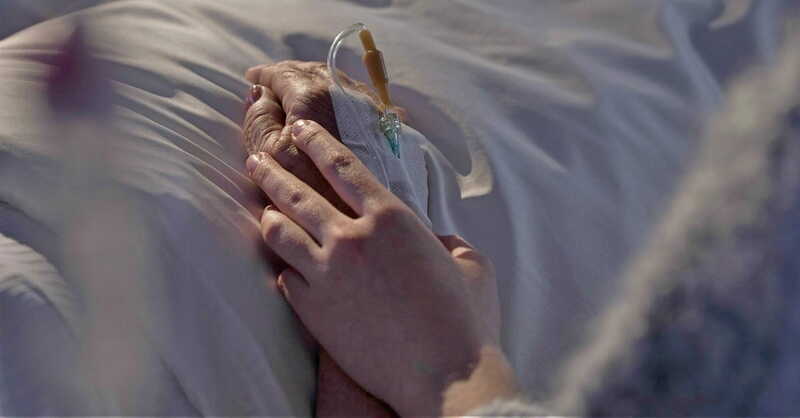 We might say, “You’ll be fine” or “You can beat this!” That optimism is helpful when facing a tragic diagnosis, but there usually seems to come a point in time when the fighting is over and the loved one is no longer prolonging life, but prolonging death. That change is often hard to notice when the person is overwhelmed by medications, with doctors examining things and nurses checking vitals. In those moments, you can help a family understand that it may be time to say their final goodbyes and discuss any last wishes for services or special items if they haven’t already. It’s not something you naturally want to do, as everyone wants to hold out hope until the very end. But a gentle invitation to see eternity may come as a helpful gift. There is usually never a perfect moment, so if you wait too long, they may only be left with regret. 5. You shepherd the family. Shepherding is more than just a visit to the hospital and a prayer. Shepherding is a continued process, not a completed task. A good shepherd protects his sheep, and sometimes you need to protect the family during these vulnerable times. It may mean being the contact person and telling someone that they shouldn’t come to visit at that moment. It may mean calling a boss to let them know what is going on, or helping the family navigate the medical issues. More than likely you’ll need to guide them in decisions after the loved one has passed. Making decisions about a casket, burial plot, headstone, flowers, and the million other things that go along with a funeral can be overwhelming. In those vulnerable times people can often feel taken advantage of and even abandoned by their pastors. It helps to know average costs, procedures, and businesses that you can refer people to that they can trust. Engaging with death and dying is not something we can choose to opt out of as believers. In many ways, it’s the culmination of our life’s work. May we be well prepared to represent the Lord and enter that sacred space! Related resource from Eternal Perspective Ministries: The Heaven booklet by Randy Alcorn is a sampling of the questions and answers found in his larger Heaven book and is distributed widely at memorial services and funerals, and used as an evangelistic tool.